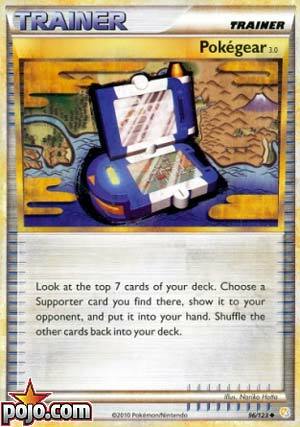 Today’s Throwback Thursday is another card that is about to receive a reprint: Pokegear 3.0 (HGSS 96/123). It is a item card which lets you look at the top 7 cards of your deck and grab a Supporter that you’ve find in those seven cards, and put it onto your hand. Some trivia is that I’ve recalled opening around 30 booster packs of HeartGold & SoulSilver and still failed to pull one. Now that Pokegear 3.0 is coming back to Standard very soon, would I be excited to get copies of those? Well, this is one of the few item cards that fetches Supporter cards, specific or unspecific. While Computer Search can search for anything, there’s also Xtransceiver NVI which could fetch you one 50% of the time, and Random Receiver DEX lets you reveal the top card of your deck until you reveal a Supporter card. However, with those three cards, they can either whiff or fetch you a undesirable card that you don’t want to use right away. I suppose the fear of Pokegear 3.0 is that unless you have 53 Supporter cards in your deck, you will fail at getting one. This unreliability is really hurting this card’s viability. And that is going to fuel up damage output of Garbodor’s Trashalanche regardless if you get a Supporter or not. Looking at past decks, mainly the World Championship decks (2010-2012) where Pokegear 3.0 was legal, out of 12 worlds decks, only Reshiphlosion deck used three copies of Pokegear 3.0. That deck had 16 Supporters, so it is more likely to get one. Besides that, it wasn’t run anywhere else. There is a older review here, and not even the review crew thought highly about it. Hello beautiful where have you been all of my life? Alright, so I’m exaggerating a bit, it’s basically the same as Random Receiver, and I loved playing Random Receiver, although this doesn’t guarantee you a Supporter like Random Receiver did. But it’s an Item card that gets you a Supporter, so it can’t be that bad. It certainly will work against my continuing argument that the Dragonite from Team Up is going to be the most broken card ever. To be fair, I am still weighing whether or not Dragonite will actually be better than the Magcargo Oranguru combo. Magcargo and Oranguru will take up two spots on your bench but will probably get you any card you want, whereas although Dragonite is just a single bench space, it can only get Supporters. And then I read that again and think, “Only gets you whatever Supporter you want.” Only! Dragonite by itself is going to get you some wins. But will it get you more than Magcargo / Oranguru? The snail and the orangutan take up a LOT less card slots too (hmm more room for Shedinja…). Of course the big winner out of this is GRI Garbodor. The more awesome items we get, the more powerful he becomes. Maybe we’ll see Trashalanche return to prominence before it gets rotated out at the end of August. And obviously that’s just a projection, it could increase in value and usage, but I think by the time it comes into the format, we’ll have plenty of other, better options (like Dragonite!). A big trend lately in the sets has been to reintroduce older cards with newer text, thus bringing back some of the biggest cards from a past format. Or at the very least save space from printing Cheren then Tierno then Hau. Pokegear 3.0 is an Item that digs through the top 7 cards of your deck and adds a Supporter to your hand. Kinda like a Great Ball for Supporters, but without the capture process that goes into the actual Pokeball mechanics. With the right amount of Supporters in the deck – and with the best ones that you’d want – you could get a good bit of value out of Pokegear 3.0. And unlike Great Ball, which doesn’t see play due to the ease of searching for different Pokemon and/or the general space of Pokemon being far less, Pokegear 3.0 could see some play enough to grab a Supporter to use in the same turn. You might have to watch out for hand disruption tactics though, but it’ll be worthwhile to use this card. Arora Notealus: It was only recently revealed that this card would be coming in the next set, so that means it’s still going to be a couple of months before we get to understand the impact that this card will have and what all its return means for the game. Just knowing though that there are such strong Supporters in both formats, I could speculate that the card might see some play. Side Reviews: Cofagrigus – Spirit Juggling is essentially Despair Ray from M Gardevoir-EX in Steam Siege, but it starts out with only 10 damage and then does 30 more damage for each Benched Pokemon you discard. It’s a good way of getting rid of Pokemon on your Bench with “come into play” Abilities, and it could be something that, alongside Ditto <Prism>, puts Cofagrigus in a good spot. However, it’s hard for me to say whether this’ll be a competitive pick, though it does combo well with Giratina and its Distortion Door. Sceptile-GX – a 1-for-60 move is great, a 2-for-130 is even better, and the GX Attack is…another heal-all GX attack. Still though, Sceptile-GX shows a lot of promise with two relatively cheap and powerful attacks. The biggest hindrance is that he’s a Stage 2 and there’s no quick way to get to him, but then we’ve got cards like Meganium around to possibly help with that. Could be the start of a Grass Turbo deck that gets Meganium to evolve Sceptile-GX and Decidueye-GX for massive quick easy damage. Next Time: Time to head back to munching on everything! Today’s Throwback is another one that looks forward, and not just to the past. Pokégear 3.0 (HeartGold SoulSilver 96/123) first released back in February of 2010 and remained Standard-legal until September of 2012. It recently saw a re-release in Japan, so odds are decent we’ll be seeing one as well in three to six months. Baby Mario and I took a look at his card nearly nine years ago; he wasn’t impressed but I thought it was solid. Pokégear 3.0 is Trainer-Trainer (what we now call a Trainer-Item) that lets you search the top seven cards of your deck for a Supporter, then add it to your hand. You don’t reveal those top seven cards to your opponent, so you can intentionally whiff if you just needed to burn a card, and if you find more than one Supporter, you only get to pick one. In the abstract, ignoring what was actually happening in the game at the time, this looks like a decent effect; Supporter counts vary from deck to deck and era to era, but seven cards is just a little under 12% of your deck. Of course, it would be impossible for you to actually search the top seven cards of a 60 card deck because Pokégear 3.0 is one of those 60 cards. You also always have to have at least one Pokémon and Prize Card on the field. I think such a situation is still possible in the Unlimited Format thanks to an opponent using Lysandre’s Trump Card (nothing is banned in Unlimited), but I’m mostly mentioning this because I was curious what the largest deck size I could contrive for Pokégear 3.0 to search: the top seven cards of a 57 card deck… which is now just a little over 12%. Let us instead consider a typical opening scenario; your 60 card deck will be 14 cards smaller, a 46 card deck. That is because you’ll have a seven card opening hand, six cards set aside as your Prizes, and one more card from your draw for the turn. Now we’re talking about a 15% chunk of your deck. As the game progresses, odds are you’re burning a Supporter each turn while also shrinking your remaining deck more and more. Pokégear 3.0 may wind up in a no-fail scenario, like having seven cards (or less) left in your deck and you already knowing the Supporter you want is in them. Of course, you could also be in a similar situation where your deck has no Supporters left in it, but unless you lost track you’ll know that before using Pokégear 3.0 (for what that’s worth). I’m not a statistician, and though I do know some math I don’t have the time or immediate knowledge to calculate the various odds one will face when using this card. From a lazy, layman’s perspective it doesn’t look too bad. Supporter counts are surprisingly varied, lately, whether sticking to Standard or the Expanded Format. You may do things that lower or increase your deck size each turn, and you’re probably using a Supporter each turn as well. The more Supporters you run, the more likely you’ll have some left in your deck as the game progresses, and probably even already have one in hand. There, Pokégear 3.0 just makes it harder to completely whiff on both any Supporter at all and the right Supporter for the current situation. If you run a lower count for Supporters, Pokégear 3.0 has a worse chance of actually finding a Supporter, but it will likely be more critical for you when it does. Of course, there are other options. Tapu Lele-GX is still a common sight in decks, even if its usage has dialed back a bit. Jirachi-EX is still there in Expanded, where it should almost never matter, and the Legacy Format, where I believe it is still a pretty great card. The Expanded and the Legacy Formats also both have Random Receiver, which guarantees you get the next Supporter in your deck, though your opponent gets to see the cards you see so you can’t intentionally fail, and you’ll never have the chance of choosing between multiple Supporters. The Expanded Format also has the Battle Compressor=>VS Seeker=>[Recycled discarded Supporter] combo, though that can be more costly than it looks at times. When we first looked at Pokégear 3.0 in the HS-era, it seemed like a solid card to me. I don’t recall whether or not it was heavily played, but risking the 2011 World Championship Decks as a sampling of the metagame, we see that the winner of the Senior Division (Reshiphlosion) ran three Pokégear 3.0. Which is is both good and bad; the Seniors Division sometimes gets by with a less competitive metagame than the Masters, and it is only one out of the four selected decks from 2011, BUT it is still a Division champ’s deck, still one of the four, and almost maxed out. By the 2012 World Championships, though, none of the decks bothered with it (though all had at least one Random Receiver, usually more). For the Legacy Format, I don’t recall seeing much use of Pokégear 3.0 either, though I haven’t had the time to wait for an opponent in that Format in quite a while. I think we have enough heavy Supporter and low Supporter decks that Pokégear 3.0 will have a place in the Standard Format. I know I’m curious what it could do for Granbull (SM – Lost Thunder 138/214) decks. You should definitely use it in the Limited Format… and since this card is likely being reprinted, you actually should have a chance to test out my advice at a Pre-Release this time. It looks like none of the HS-era Theme Decks contained it; I’m hoping the pending reprint will give me an excuse to rate it for the Theme Format. I mean, it should be pretty nice there. Pokégear 3.0 is there to make getting the right Supporter more likely while also making it less likely you’ll lack a Supporter or out to a Supporter at any point in the game. Most decks would like that but also won’t have space, even in the Legacy Format where this is still legal. As a reprint, though… it might have a home in a few competitive Standard archetypes.